Is Poured-in-Place Rubber Safety Surfacing Actually Safe? 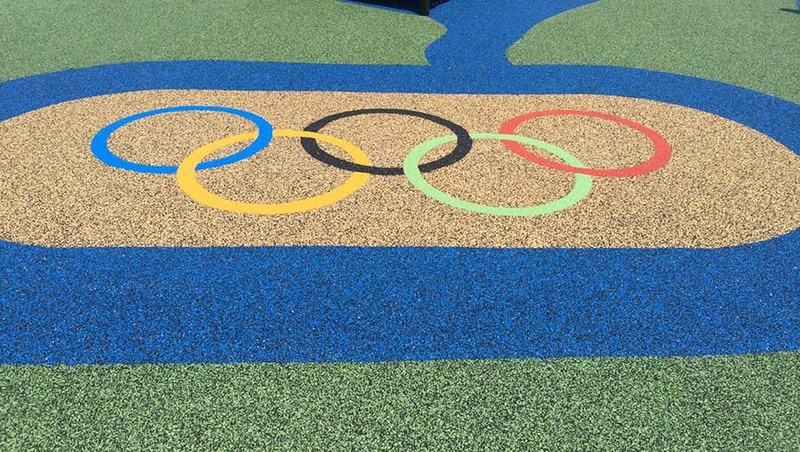 You probably already know that poured-in-place (PIP) rubber surfacing is the most popular playground surface choice for city parks and school playgrounds. The reasons are many. 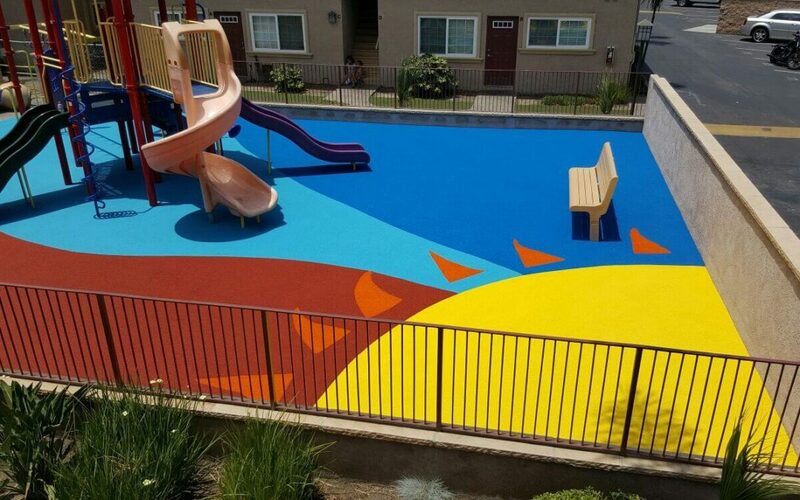 PIP safety surfacing gives you color, designs and theme options that are eye-catching (to attract the kids) or that blend in with the existing landscaping (to keep the grown-ups happy). But is poured in place rubber safe? Let’s take a look at the facts and see how companies like No Fault Sport Group take responsibility for one of the most popular outdoor playground products on the market. What is PIP Safety Surfacing? First, let’s look at the product, since different manufacturers have different names for their products and there may be some confusion as a result. No Fault Safety Surface is made of clean recycled rubber and a decorative top layer made of virgin rubber EPDM (Ethylene Propylene Diene Monomer) or TPV (Thermoplastic vulcanizates) granules held together by polyurethane binding agents. The type of rubber selected depends on the application, location and color selections for the project. The sub-base onto which the PIP surfacing is poured must be at least four inches thick and have a gradual slope to promote drainage. These underlying foundations are usually asphalt or concrete. The two layers of rubber are mixed and poured on-site in two layers: an impact-absorbing layer topped beneath the decorative TPV or EPDM wear layer (available in a wide variety of colors and patterns). After the PIP surfacing is poured, it is hand-troweled using guide rods, and then cured to form a unitary (unbroken) sheet of shock-absorbing safety surface. The end result is a highly durable, permeable, slip-resistant surface providing cushioned comfort in an unconventional palette of color combinations. Because it is a unitary surface, PIP does not move or shift around. This means your team won’t be constantly adding additional loose fill surfacing, replacing mulch, or fixing torn tiles. Cleanup usually takes little more than a leaf blower, though using approved cleaning solutions for a more thorough wash-down may be a good idea on occasion. PIP also comes in different thicknesses, determined by the maximum critical fall height needed for your location. This ensures maximum safety for all the kids you are responsible for. Because PIP is a seamless surfacing material typically sloped to ground level, it is highly ADA accessible. This means wheelchairs can move easily over the surface, unlike with gravel, sand or mulch. Finally, poured-in-place surfacing is one of the most versatile, durable and visually attractive surfacing options available. The typical lifetime of PIP surfacing ranges up to 10 years, depending how much use it gets. Though there are other less expensive options, PIP makes the most sense for a long-term investment due to the lack of ongoing maintenance and longevity of the product. So … Is PIP Surfacing Safe? Will it Protect Kids When They Fall? Do Recycled Tires Contain Metal? What goes up must come down, and no one knows this better than PIP manufacturers. Critical fall height (CFH) refers to the impact attenuation (or shock absorbency) of a surface material and is the “maximum height from which a life-threatening head injury would not be expected to occur.” Naturally, this depends on the vertical distance between a designated play surface and the protective surfacing beneath it. Ensuring that a product meets the required CFH is best done via field impact attenuation testing. The added cost of field testing is the best insurance for your investment and for the safety of the children using the play area. Because most PIP surfacing gets slightly harder when it is cold, impact testing should be done on cool days to ensure the surface is compliant all year-round. The complete No Fault Safety Surface System provides you with a resilient, porous and seamless playground safety surface that is known to be the absolute best playground safety surface available for fall protection. It is tested and proven to provide fall protection up to 12 feet (with a PIP depth of 6.5 inches). You can count on kids to put their hands and mouths all over everything, and (naturally) rubber playground surfacing is no exception. That’s why the California Integrated Waste Management Board performed extensive testing on potential skin irritants and potentially carcinogenic chemicals that may be present in poured-in-place surfacing. (Read details here: Are Poured in Place Playground Surfaces Safe? By David Spease, ASLA, CPSI.) Although natural rubber contains latex (a skin sensitizer), the tests showed no skin irritation as the result of contact with poured-in-place surfacing materials. Furthermore, all chemicals in recycled rubber that could be considered carcinogens occur at concentration levels far below the level of one part per million (generally considered an “acceptable” level). Finally, the study also looked at the health effects of ingesting of tire shreds and determined that it was unlikely to produce any adverse health effects in a 3-year-old child. However, since PIP is a solid surface product, there should never be any loose pieces of material from it. Tires used for PIP surfacing undergo an extensive sieve process to remove fibers and are then sent via conveyor belt to have any metals removed via powerful magnets and vacuums. American Standard for Testing Methods (ASTM): A body that administers a non-governmental, third-party certification program and tests for public safety. They certify a broad range of safety and protective products used occupationally and recreationally. Consumer Product Safety Commission (CPSC): A body that protects the public from unreasonable risks of serious injury or death from consumer products that might pose a fire, electrical, chemical, or mechanical hazard. That said, PIP products cannot be visually inspected for compliance; certificates of compliance simply indicate that the products will comply if installed as recommended. The owner of your project is ultimately responsible for ensuring that all products used meet applicable safety requirements. Whether you’re planning a playground, jogging track, water play area, walking path or pool deck, our coast-to-coast installation service gives you consistent quality. All of our poured-in-place Safety Surface products are engineered on-site by a certified installation crew. Weigh your options. Look at the competition. Find out why No Fault is the choice for parks and recreation departments, resorts and hotels, children’s hospitals, public and private schools, and theme parks all over the nation.